Timothy Michael "Tim" Kaine (born February 26, 1958) is an American politician. He is serving as the junior United States Senator from Virginia. A member of the Democratic Party, Kaine was first elected to the Senate in 2012. Kaine declared his candidacy for Governor of Virginia in 2005 in a bid to replace Mark Warner (who was constitutionally unable from serving another term. Kaine won in an uncontested Democratic primary, and faced Republican Attorney General Jerry Kilgore in the general election. Kaine won with 51% of the vote, to Kilgore's 46%. Kaine served as governor from 2006 to 2010. After becoming governor, Kaine gave the Democratic response to the 2006 State of the Union Address. He later became the 51st Chairman of the Democratic National Committee, serving from 2009 to 2011. In 2012, after incumbent Senator Jim Webb announced he would retire, Kaine declared his candidacy for the U.S. Senate. Kaine won in the Democratic primary and faced former Senator and Virginia Governor George Allen in the general election. In the November 2012 election, Kaine won with 53% of the vote to Allen's 47%. On July 22, 2016, he was picked to be Hillary Clinton's running mate for the 2016 presidential election. He lost the election to Donald Trump and Mike Pence on November 9, 2016. Kaine was born in Saint Paul, Minnesota. He is the eldest of three sons. 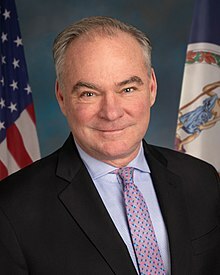 Kaine was born to Mary Kathleen (née Burns) and Albert Alexander Kaine, Jr.. Kaine's father is of Scottish and Irish ancestry, and his mother is of Irish descent. Kaine grew up in Kansas City, Missouri. He graduated from Rockhurst High School in Kansas City, Missouri. Kaine received his B.A. in economics from the University of Missouri in 1979. Kaine was a Coro Foundation fellow in Kansas City in 1978. He then attended Harvard Law School. He took a break during law school to work with the Jesuit Volunteer Corps in Honduras. Kaine worked in Honduras for nine months from 1980 to 1981. Kaine graduated from Harvard Law School with a law degree in 1983, and was admitted to the Virginia Bar in 1984. Kaine practiced law in Richmond for 17 years, specializing in fair housing law and representing clients discriminated against on the basis of race or disability. Kaine was an adjunct professor for University of Richmond Law School for six years. In May 1994, Kaine was elected to the city council of the independent city of Richmond, from the City's 2nd District. He served four terms on the council. n July 1998, Kaine was elected mayor of Richmond, Virginia. He replaced Larry Chavis. He was chosen by a majority-black City Council, becoming the city's first white mayor in more than ten years. Kaine voted against to tax increases, and supported a tax abatement program for renovated buildings, which was credited for a housing-renovation boom in the city. Richmond was named one of "the 10 best cities in America to do business" by Forbes magazine during Kaine's term. During his tenure as mayor, Kaine drew criticism for spending $6,000 in public funds on buses to the Million Mom March, an anti-gun-violence rally in Washington, D.C.; after a backlash, Kaine raised the money privately and repaid the city. Kaine ran for Lieutenant Governor of Virginia in 2001. In the Democratic primary election, Kaine ran against state Delegate Alan A. Diamonstein and state Delegate Jerrauld C. Jones. Kaine won, winning 39.7% and defeating Diamonstein, who received 31.4%, and Jones, who received 28.9%. In the general election, Kaine won with 925,974 votes (50.35%), of the vote, narrowly edging out his Republican opponent, state Delegate Jay Katzen, who received 883,886 votes (48.06%). In 2005, Kaine ran for governor of Virginia against Republican candidate Jerry W. Kilgore, a former state attorney general. Two polls released in September 2005 showed Kaine loosing Kilgore—by four percentage points in a Washington Post poll and by one percentage point in a Mason-Dixon/Roanoke Times poll. The final opinion polls of the race before the November election showed Kaine slightly edging ahead of Kilgore. Kaine won, winning 1,025,942 votes (51.7%) to Kilgore's 912,327 (46.0%). Kaine was sworn in as governor at the colonial Capitol at Williamsburg, on January 14, 2006, the first governor since Thomas Jefferson to be inaugurated there. 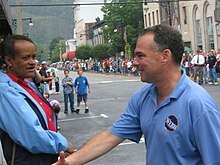 Kaine served as chairman of the Southern Governors' Association from 2008 to 2009. As governor, Kaine successfully protected 400,000 acres (1,600 km2) of Virginia land from development, fulfilling a promise that he made in 2005. As governor, Kaine established the Climate Change Commission, a bipartisan panel to study climate change issues. In October 2006, Kaine signed an executive order banning smoking in all government buildings and state-owned cars as of January 1, 2007. He signed legislation banning smoking in restaurants and bars. It made Virginia the first Southern state to do so. Kaine was governor during the Virginia Tech shootings. As governor, Kaine approved about $3.31 billion in general fund spending cuts. In 2008, Kaine backed a $22 million proposal in the Virginia General Assembly to make pre-kindergarten education more accessible to at-risk four-year-olds. He left office with high polling numbers in January 2010. On January 31, 2006, Kaine gave the Democratic response to President George W. Bush's 2006 State of the Union address. In it, Kaine criticized the Bush administration's No Child Left Behind Act for "wreaking havoc on local school districts"; criticized congressional Republicans for cutting student loan programs; and condemned as "reckless" Bush's spending increases and tax cuts. In January 2009, Kaine became the Chair of the Democratic National Committee. He took the position at the request of President Obama, During his tenure he oversaw a significant expansion of the party's grassroots focus through Organizing for America. Kaine announced on April 5, 2011 that he would run for United States Senate in 2012, following Senator Jim Webb's decision not to seek re-election. Kaine filmed announcement videos in English and Spanish. Kaine was unopposed for the Democratic nomination. Kaine defeated former Senator and Governor George Allen in the general election. As a member of the Senate Committee on Foreign Affairs, Kaine pushed for a new Congressional authorization of military force for the American operations against ISIL. Kaine supported the Joint Comprehensive Plan of Action with Iran, though he also helped Republican Senator Bob Corker hold a vote on a resolution of disapproval on the deal. Kaine undertook several trips throughout the Middle East, meeting with the leaders of states such as Turkey and Israel. While in the Senate, Kaine has continued to teach part-time at the University of Richmond. Kaine endorsed Hillary Clinton's presidential bid in 2016, and campaigned actively for Clinton in seven states during the primaries. On July 22, 2016, he was picked to be Clinton's running mate for the election. The New York Times had said that Clinton's husband, former President Bill Clinton, privately supported Kaine as his wife's vice-presidential selection. Kaine is the first Virginian to serve on a major party's national ticket since John Tyler ran on the Whig ticket in the 1840 election. Kaine is a Roman Catholic. In 1984, he married his wife Anne Holton, who is the current Virginia Secretary of Education since 2014. Together, they have three children. ↑ Steve Hendrix (18 Oct 2012). "Tim Kaine's convictions and ambitions". Washington Post. ↑ 2.0 2.1 Peralta, Eyder (13 June 2013). "With A Speech In Spanish, Tim Kaine Makes Senate History". NPR. Retrieved 12 June 2013. ↑ 3.0 3.1 Chozick, Amy (July 22, 2016). "Hillary Clinton Selects Tim Kaine, a Centrist Senator From a Swing State, as Running Mate". The New York Times. Retrieved July 22, 2016. ↑ Nuckols, Christina (October 16, 2005). "Profile: Who is Timothy M. Kaine?". The Virginian-Pilot. ↑ Danielle Burton (April 18, 2008). "10 things you didn't know about Tim Kaine". U.S. News & World Report. ↑ "Notable Coro Alumni". CORO. Archived from the original on February 19, 2011. Retrieved May 4, 2016. ↑ Tim Kaine Running for Senate, National Catholic Reporter (April 5, 2011). ↑ Danielle Burton, 10 Things You Didn't Know About Tim Kaine, U.S. News & World Report (July 18, 2008). ↑ 9.0 9.1 Virginia: Past Governors' Bios: Tim Kaine, National Governors Association (accessed July 21, 2016). ↑ Trevor Baratko, For a professor and his pupil, politics align, Loudoun Times-Mirror (October 19, 2012). ↑ "Praising Kaine". Richmond Times-Dispatch. June 1, 1994. p. A-10. ↑ Amy Biegelsen, What's a Nice Guy Like Tim Kaine Doing in a Job Like This?, (Richmond, Va.) Style Weekly (February 25, 2009). ↑ Melissa Scott Sinclair, Is Kaine Able?, (Richmond, Va.) Style Weekly. ↑ Virginia Gov. Tim Kaine to Address University Of Virginia's Class of 2006 at Final Exercises on Sunday, May 21, UVA Today (University of Virginia) (May 16, 2006). ↑ Liz Halloran, Tale of the Tape: Ex-Governors Duke It Out In Va., NPR (May 17, 2012). ↑ Hank Shaw, Difference Few among Democrats, Free Lance-Star (May 21, 2001). ↑ Elections Database: 2001 Lieutenant Governor Democratic Primary, Virginia Department of Elections. ↑ Elections Database: 2001 Lieutenant Governor General Election, Virginia Department of Elections. ↑ Michael Sluss, Kaine, Kilgore in a dead heat, Roanoke Times (September 17, 2005). ↑ Michael D. Shear & Claudia Deane, Poll Shows Kilgore Ahead of Kaine in Va., Washington Post (September 11, 2005). ↑ Warren Fiske, Life after the campaign for Jerry Kilgore, The Virginian-Pilot (April 30, 2006). ↑ Elections Database: 2005 Governor General Election, Virginia Department of Elections. ↑ Sean Gorman, Macker-Meter: Preserve 400,000 acres of open space, PolitiFact Virginia (June 1, 2015): "It's becoming a tradition for winning gubernatorial candidates to make campaign promises to preserve 400,000 acres from development. Tim Kaine did it in 2005 and state figures show he met his pledge." ↑ Lydia Wheeler, McAuliffe reconvenes climate commission Tim Kaine formed the group in 2008 when he was governor, The Virginian-Pilot (July 3, 2014). ↑ Shear, Michael D. (October 27, 2006). "Kaine Bans Smoking in Most Government Offices". Washington Post. Retrieved May 4, 2016. ↑ Kumar, Anita (March 10, 2009). "Dmoking Ban Signed as VA Democrats Take Aim at GOP Nominee". Washington Post. Retrieved May 4, 2016. ↑ Transcript of Gov. Tim Kaine's Convocation remarks, Virginia Polytechnic Institute and State University (April 17, 2007). ↑ Tim Kaine Official Website (August 6, 2008). "Southside Child Development Tour". Commonwealth of Virginia. Retrieved August 6, 2008. ↑ Transcript: Virginia Governor Tim Kaine's Response, CQ Transcriptions (reprinted by the Washington Post) (January 31, 2006); see video of the response via C-SPAN). ↑ Chris Cillizza (5 January 2009). "Tim Kaine and the Future of Obama For America". The Washington Post. Retrieved 26 April 2016. ↑ Cillizza, Chris (2011-04-05) "Tim Kaine announces for Senate in Virginia", Washington Post. Retrieved 2011-04-05. ↑ O'Brien, Michael (2011-04-05) "Tim Kaine launches Virginia Senate bid", The Hill. Retrieved 2011-04-05. ↑ "Kaine hits the road to tout economic plan", Washington Post. Retrieved 5 April 2012. ↑ "Republicans fight to reclaim the Senate majority: 2012 races to watch". ABC. 1 June 2012. ↑ 36.0 36.1 36.2 Herb, Jeremy (22 July 2016). "How Kaine rehabbed his VP resume". Politico. Retrieved 23 July 2016. ↑ http://pfds.opensecrets.org/N00033177_2014_A.pdf United States Senate Financial Disclosures: Annual Report for Calendar 2013 (Amendment 1): The Honorable Timothy M. Kaine (Kaine, Tim), (filed July 22, 2015). ↑ "Bill Clinton Said to Back Virginia's Tim Kaine for Vice President". New York Times. Retrieved July 20, 2016. ↑ Schapiro, Jeff (20 July 2016). "Schapiro: Don't underestimate Tim Kaine, say ex-foes Jerry Kilgore, George Allen". Richmond Times-Dispatch. Retrieved 22 July 2016.